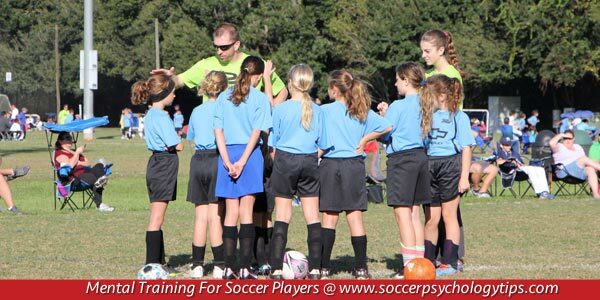 Bad passes, missed breakaways, and defensive mistakes are very frustrating events for both coaches and soccer players. Emotions can run high in competition. Your immediate reaction after an error might be to be disappointed and/or tell the player how to prevent the mistake from happening in the future. From our perspective, you first need to be in control of yourself before you can help the player gain control and regain his composure. Here are a few tips for helping your athletes play on with confidence and composure immediately following a mistake. If the player sees that your frustrated after a mistake, that only amplifies the emotional pain for the player. Display composure yourself so the athlete learns by observation how to deal with adversity. Do not attempt to coach the athlete under the umbrella of anger or frustration. Wait until you calm down before giving instructions. Save your instruction for the next break in play when you and the player have both cooled off. Your reaction to a mistake may be to reprimand the player, but that may only lead to deflating his confidence further, resulting in more mistakes. An athlete needs to know that you still have confidence in him after a mistake. Even if you feel like benching the player, show him your support with a verbal or non-verbal reinforcement such as a word of encouragement or a pat on the back. Dwelling on the error only serves to make you more frustrated and upset. Let the mistake go – it’s in the past, you can’t change what happened. You can only change your reaction to it. And to do your job well, you need to focus on the current play, not the last one. A team atmosphere in which players support each other after a mistake is a mark of a cohesive team. Ask the team members to commit to showing their confidence in their teammates after a mistake or setback. In order for soccer players to improve and get to the highest level, they have to take risks. That means taking players on 1v1, attempting to curve the ball in on a free kick, and trying new moves. Inevitably, when players are learning a new skills, mistakes will happen. Create an atmosphere in practice and games that encourages this type of risk taking on the field. Help your players understand that mistakes are a necessary part of becoming a great soccer player. Praise your players for trying something new, even if it doesn’t work out. How Can Your Players Stay Composed After Mistakes? Hey, if you enjoy reading our mental game tips, please share this site with other soccer players, coaches, or parents who would appreciate it.